Andy was my middle son and born after I had suffered through four miscarriages and the Dr. telling me I could not carry another child full term. Not only was he full term but he was a hefty 10 pounder at birth! 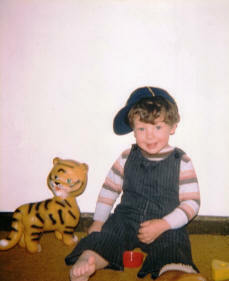 Andy was a healthy and happy baby and such a sweet and cuddly one. He was later diagnosed as ADD and ADHD but at 9 months old, when he stood up, then ran across the room, after never crawling or taking tentative steps like most babies, we thought he was pretty amazing. He never slowed down and once he started school, it became quite a problem. His kindergarten teacher said he was extremely disruptive and wanted him put on Ritalin and our pediatrician complied. The first night after taking his first dosage, he crawled up in my lap and cried and told me he wanted to go live in Heaven with his Grandpa. It would take me a very long time to tell all the things that went wrong over the years and how difficult life was for him, for our family, so I want to focus on the positive. Andy was always a protector of his brothers. He might pick on his younger brother sometimes, but no one else better not do that! He had a weird but funny sense of humor and loved to play tricks on people. 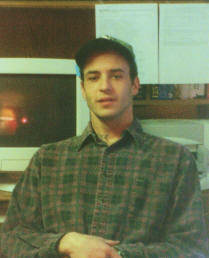 He was an avid reader and loved books. Andy had a sense about technology without reading the manuals. He could build things with electronic kits that were not even listed in the manual. When he was 14, he made a tatoo gun out of my answering machine. Can't say I was happy about it but I did recognize his inventive nature. At 11, he marched thru the living room wearing nothing but an entire suit of armor made from a big cardboard box and wire clothes hangers. One time I started to move a TV set and it was almost weightless. Andy had gutted it and made a personal safe out of it. I taught him to play chess when he was young and he got so good at it that I could never win. He could play three boards at the same time, make all his moves within 15 seconds and usually win all three games. The picture above was taken the last time we got to see Andy. 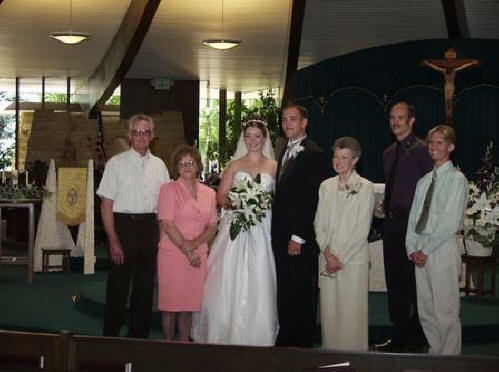 It was his younger brother, Spencer's wedding on June 14th, 2003. In the picture are the important people in his life. The first couple are his Godparents, Jim and Judie Sellmeyer, Spencer's beautiful wife, Susan, and then Spencer. Me, their Mom, Andy behind me wearing the dark purple shirt, and next to me is James, Andy's roommate. James died on November 8th, 2003. Andy went back to Kansas City the next day. I talked to him the last time on Mother's Day, 2004. A few days later, he completed suicide, on May 24th, 2004. We brought him back to Wichita and had his farewell Mass at the same church with the same priest who had officiated at Spencer and Susan's wedding. His final resting place is in a tiny Catholic cemetery in Glasgow, Missouri just a couple of rows away from where his godparents have their family plots. We love him, we will always miss him but we are all counting on him being at peace now and no longer suffering with clinical depression. I had "GONE HOME" put on his marker and I believe he has.